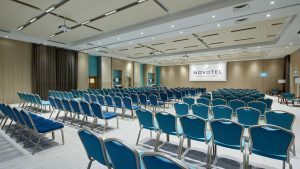 Novotel Istanbul Bosphorus welcomes its guests in Karakoy, the district of Beyoglu, known as the heart of Istanbul for centuries, with its rich historical texture and new attraction center. Offering a unique service to its guests with its modern building in Karakoy, Novotel Istanbul Bosporus offers its guests a 5-star Istanbul hotel with its modern and stylish architecture and comfortable rooms as well as its central location close to the most important historical stops of Istanbul. With its relaxing and comfortable rooms, Novotel Karakoy makes a difference with its quality and elegance among other Karakoy hotels. 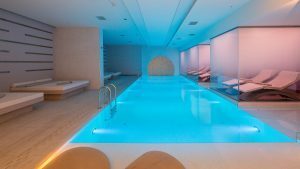 Offering an indoor swimming pool, sauna, steam bath, Turkish bath, massage services and free WIFI Internet access for guests, our hotel differentiates with its delicious kitchen. Every morning, our guests can have a great open-buffet breakfast, and they enjoy lunch and dinner while watching one of the most beautiful views of Istanbul. As one of the most preferred restaurants in the city, Mürver Restaurant, located on the terrace floor with its unique historical peninsula view, is waiting for its guests who want to experience both Istanbul view and unique tastes from Turkish and world cuisines. Also Gourmet Restaurant in our lobby serves a delicious menu every hour of the day for the guests. When you arrive in Istanbul, it is very easy to reach both Karakoy and Novotel Istanbul Bosphorus. Located in the neighborhood of Tophane, Eminonu, Azapkapi, Sishane and Beyoglu districts, Karakoy is connected to all districts by the famous Galata Bridge and roads on the square. Karakoy is approximately 20 kilometers away from Ataturk Airport. Buses, taxis, subways or trams can be used to arrive at the Novotel Karakoy from Ataturk Airport. To reach the hotel, you can prefer to take the metro or highway, and when you come to Karakoy you can reach our hotel in just a few minutes on foot. The central location of the hotel is also very convenient for those who want to enjoy the city. The hotel is close to the ferry port, tram or bus line to reach every point of the city. In addition, walking line on which our hotel is located is very suitable for those who want to experience the unique texture of the city. From the hotel you can reach the Historic Peninsula by walking along the coast, or in a few minutes you can embark on a journey to Istiklal Street, the symbol of Beyoglu. You can also walk to Eminonu and Karakoy ferry ports, the points where Prince Islands, Anatolia and the Bosporus tours are organized. You can reach the Golden Horn, the Galata and the Sultanahmet by walking from Karakoy, the center of artistic and cultural activities. 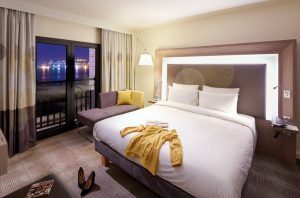 One of the most comfortable hotels in Istanbul, which has the most beautiful view of Istanbul and hosts thousands of tourists every year with its historical sites, Novotel Istanbul Bosphorus is appreciated by the guests coming to Istanbul with the ease of transportation that it offers. Karakoy is one of the districts that allow you to experience the unique texture of Istanbul, which embraces the history of centuries in every street. Like the heir of a long history with all its streets and buildings. When you come to Istanbul; if you want to enjoy history, culture, flavors, entertainment life, you are at the right address. Because all of the historical and touristic places in the Novotel Karakoy neighborhood are within walking distance. You can walk to Galata Tower, the fire tower in the time of Ottoman Empire and now becoming the symbol of Istanbul, and you can start your day by looking at this view from the window of your room. You can walk to Galata Bridge, the connection road between the Historical Peninsula and Karakoy, and you can reach Eminonu, where the Historic Spice Bazaar is located, in 15 minutes. Novotel İstanbul Bosphorus is just a tram ride away from Sultanahmet where important historical stops such as Beyazit, where the famous Grand Bazaar is located; Topkapi Palace, Hagia Sophia Museum and Basilica Cistern, where the Ottoman sultans lived for centuries. You can make a pleasant trip to the Kamondo Merdivenleri, which is also known as the Lovers Stairs, which is actually built by the wealthy family of the period, the Kamondo Family, for the grandchildren to have easy access to school. This is one of the favorites of Instagram photographers. You can visit churches like Saint Benoit Church and monastery, Haghios Nikolas Turkish Orthodox Church, Galata Bulgarian Church, Church of Santa Maria and Church of Saint Michael spread all over the neighborhood. SALT Galata, Ottoman Bank Museum and Turkey Jewish Museum are also among the important cultural stops that can be visited in Karakoy. Kılıcali Pasha Mosque, one of the most important buildings by Mimar Sinan, is located in Tophane and the Kılıcali Pasha Bath, which is still open today, and the Tophane Square Fountain in the same area are also within walking distance. Within a 15 minute of walk from Tophane, you can visit the Dolmabahce Palace, which is one of the must-see places of Istanbul, and where Ataturk passed away. One of the first choices of those who want to get to know Istanbul’s night life is Karakoy. Karakoy’s lively nightlife contributes to the enjoyable time of the hotel guests, while the easy access to the attractions such as Taksim, Besiktas, Bebek, Arnavutkoy and Kurucesme, which are known for their fun venues, make Karakoy a different center of attraction. If you want to make a quick entry to Istanbul’s nightlife, you can enjoy music, delicious food and views from the restaurants, cafés and bars located around the hotel. Karakoy, which makes the night of Istanbul colorful with its nightclubs and live music bars, wins the appreciation of the entertainment lovers. To enjoy dancing, music and entertainment, you can have fun in special nightclubs in Karakoy.